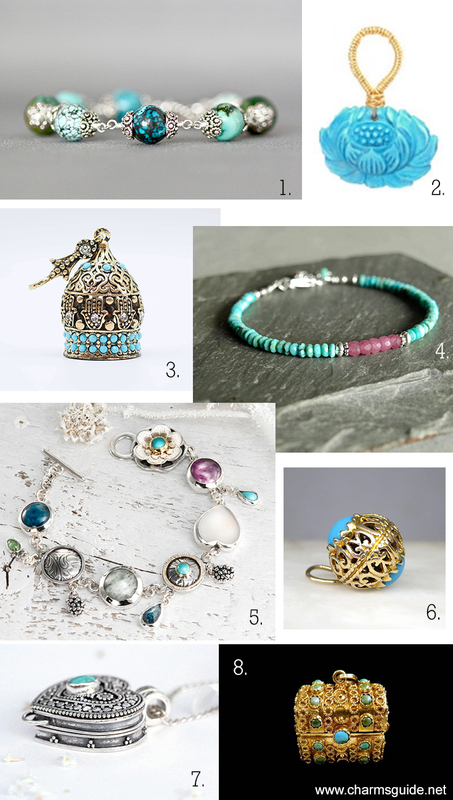 Facts, folklore, healing properties and our curated selection of turquoise jewelry. While most agree on the birthstones for each month, there are some variations. The standardized stones for December are Turquoise, Tanzanite and Zircon, and some also include Blue Topaz. Turquoise is one of the oldest known gemstones, used and appreciated in many different cultures since ancient times, not only for its beauty, but also because it was believed to be a good luck talisman that brought protection and power. Turquoise is of course turquoise, and it gets its blue color from copper. There are other, less common, variations on the color such as a deeper blue-green and bright green, and the color depends on the chemical composition of the earth where it is formed. The green hues come from iron and chrome. The most valuable turquoise is a solid robin’s egg blue with no discolorations or veins, and most of these are mined in Iran and the southwestern part of the US. Currently, the US is the world’s largest producer of turquoise, and the best quality stones are found in Arizona. Turquoise is also the 11th wedding anniversary gemstone. An important stone in crystal healing, turquoise is thought to protect the physical body, balance the chakras, help the chi flow and combat depression. It strengthens the immune system and benefits the brain (migraines), eyes, ears, neck, throat, lungs and stomach. It is also believed to dispel negative energy, help with communication and creativity, and bring friendship, courage, love, a long life, happiness and good luck. 1. Sterling silver bracelet with round multi-colored turquoise beads. Multi-colored turquoise bracelet by Robin Aronson of The Time Out Collection. 2. Wire wrapped carved turquoise flower pendant by Calico Juno Jewelry. 3. Metal tassel cap with a hamsa hand design and set with turquoise and rhinestones. I know it’s not a charm, but I just couldn’t resist it, and if you add a jump ring, it can be used as a pendant. Handmade by Antonia of Nena Jewellery. 4. Delicate bracelet made from turquoise beads, faceted pink sapphires and sterling silver. Turquoise and sapphire bracelet by Blue Green Jewels. 5. Sterling silver art jewelry bracelet with 22k gold, kyanite, aquamarine, turquoise, mother of pearl and amethyst. charms and accents. Multi-gemstone charm bracelet handmade by Limor Gefen of Gefen Jewelry. 6. 14k gold charm or pendant set with two turquoise stones. Floral pattern charm from Les Curieux. 7. Sterling silver locket pendant set with a turquoise stone. Charm necklace by Don Bui Silver. 8. Vintage moveable 18kt yellow gold treasure chest charm set with turquoise gemstones. Etruscan style 1930s charm from HPS Jewelers.